The cost of my service would be a fair finders fee that you and I would talk about before I come. If you're needing me to recover an item from water it's usually a bit more but definitely within reason. Land detecting,water detecting and scuba diving...Beaches, parks, lakes & yards. 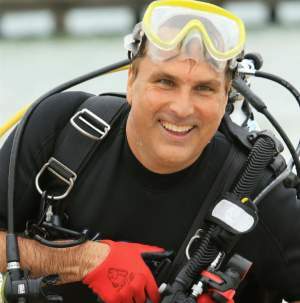 I am a professional detectorist and I am a certified scuba diver. I have experience recovering items on land and in water. Steve, is absolutely amazing and I cannot possibly say enough good things about this man. Steve is not joking when he says he WILL find your ring. After ripping apart my entire home, I reached out to Steve late one evening and his calm demeanour put me at ease when he said he would come the very next morning to help us. When he came to search for the ring he thoroughly canvassed both our driveway and my friend’s driveway to find the ring. 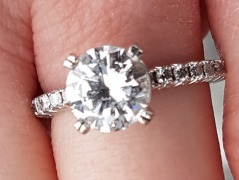 He insisted that we drive across town to find the ring even when my spirits were so low and doubtful that I would ever get my 1.5 carat ring designed by my fiancé. He reminded us that he would find the ring. When we got to my friend’s house, I ended up going back into our vehicle because I truly didn’t believe we would find our ring and I was so upset. Minutes later, Steve was able to find my ring burried at the bottom of a snow bank!! The funny thing is I had never even gone near that area of the house but once again Steve insisted to check the entire area! I was absolutely speechless and in that moment all I could do was hug him because I was so happy!!!! It was a very special moment for all 3 of us when Steve presented my ring to me. What started off to be a horrible 2018 was turned around entirely because of Steve! DO NOT hesitate to call him! He is simply the best and will work diligently with you until he finds it (and he WILL find it!). Thank you again Steve for saving my year and my engagement! I went from absolutely devastated to insanely happy and speechless. I will always recommend Steve to anyone who has lost their rings, keys, etc that they can’t find! Steve is very professional and has very expensive equipment that will find your ring. He knows his equipment very well and has a very calm and caring personality to make you feel at ease. Steve – Thank you, thank you, thank you!!!! !